As part of the National Dying Matters Awareness Week (12-18 May 2014), which has been organised by the Dying Matters Coalition to encourage people to talk openly about dying, death and bereavement. Throughout Dying Matters Awareness Week, events and activities are being held up and down the country to raise awareness about end of life issues. Dying Matters – what is important to you? 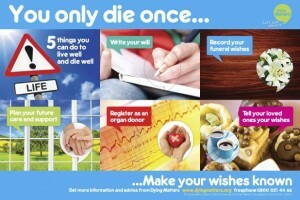 For more information visit the Dying Matters week campaign page.